Formed in 1994, University Hospital of South Manchester NHS Foundation Trust is a major acute teaching hospital Trust, providing services to adults and children at Wythenshawe Hospital and Withington Community Hospital, which is owned and managed by South Manchester Primary Care Trust. The Trust employs 5,200 people including 800 who are employed via South Manchester Healthcare Limited, the Trust’s Private Finance Initiative (PFI) partner. With over 430,000 patient attendances annually, patient care is of the highest importance. Like many NHS organisations, the Trust has invested in IT systems to meet the requirements of the National Programme for IT (NPfIT). The NPfIT has been set up to improve patient care by increasing the efficiency and effectiveness of clinicians and other NHS staff. University Hospital of South Manchester has already implemented several new clinical systems to support different departments – from a theatre management system, to one that follows a patient’s care in the maternity department from first appointment through to delivery. To enable the IT team to support the increasing numbers of users of the many new systems, the organisation invested in Hornbill’s Supportworks ITSM. Supportworks was selected by the procurement team as the best fit for the Trust’s requirements. The team felt that Supportworks was easy and intuitive to use and could easily be customised. It also provided a framework to enable the adoption of ITIL. Improved workflow processes have streamlined service provision to staff and clinicians and therefore to patients. 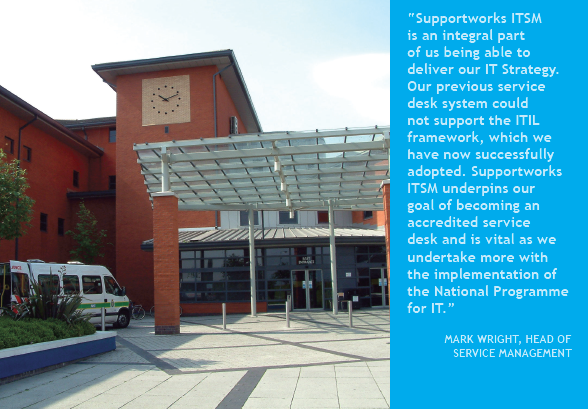 Over fifty IT staff use Supportworks ITSM. It has replaced manual recording of Problem and Change management activities, aligning its new working practices with the ITIL framework. This has involved a major reorganisation and policy review as to how the team manages problems and change control. Powerful reporting capabilities provide an audit trail for Problem and Change management. Supportworks enables staff to provide an audit trail of Problem and Change management activities, with evidence of service improvement backed by management reports. For the Trust, this is of particular importance as they work towards Service Desk Accreditation. Configuration Management Database enables more efficient management of IT assets, including licensing and lease expiry dates. South Manchester uses Supportworks ITSM Configuration Management Database (CMDB) to manage its IT assets more effectively, including licensing information and lease expiry dates. In addition, the IT team has recently started to use the system to support another important service within the Trust. Supportworks has enabled a seamless introduction of the Registration Authority service. With sensitive data managed under the NHS Care Records Service (NHS CRS) and the NPfIT services like ‘Choose and Book’ and ‘Electronic Prescription’ services, a common approach is required to protect the security and confidentiality of every patient’s personal and healthcare details. Like other NHS Trusts that need to access patient information within the NHS Care Records Service, South Manchester has set up a Registrations Authority (RA) to manage the process. The RA is responsible for verifying the identity of healthcare professionals and workers using the services within the Trust. Whether it is the administration desk booking an appointment, or a clinician that wishes to refer to the patient records, a check on their identity and level of needs is necessary before they are granted access to the appropriate level of information for their work. The NHS CRS Smart Cards are used to manage these checks – helping to control who accesses the Care Records and their level of access. The IT team at the Trust is using Supportworks ITSM to record the details of every Smart Card issued, including user identifier, access rights and a history of any changes and the expiry date (normally after a two year period). The IT team has found that it is able to resolve most Smart Card queries at first line. The service desk is able to resolve most queries quickly, as they have the user information to hand. Customer SelfService portal enables calls to be logged online, enhancing the efficiency of the service provided. The Customer SelfService portal within Supportworks has also enabled the IT team to provide more effective support. Over 4,000 users throughout the Trust are able to log queries and track progress of calls via the web. Managers in the Trust also use the Customer SelfService feature to log requests, order equipment for new staff, and request replacements or upgrades. New user accounts can also be requested, further automating the tasks associated with bringing new staff on board.